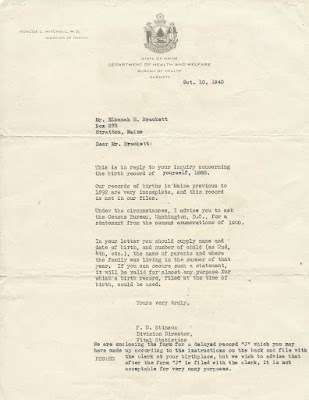 October 10, 1940 form letter reply from P. B. Stinson, Director of the Division of Vital Statistics of the State of Maine Department of Health and Welfare, in response to an inquiry from Elkanah Herbert Brackett of Stratton, Maine. Stratton is a village in the town of Eustis. P. B. Stinson was Parker Burroughs Stinson (1892-1969), son of William Fullerton Stinson and Lucy Emma (Jackson) Stinson, and husband of Jessie Willett (Coombs) Stinson. Mr. Bracket had inquired about his birth record, perhaps in response to the recent establishment of the Social Security Administration. The letter reflected the fact that not all births before 1892 were recorded, when such reporting to the State was not mandatory. 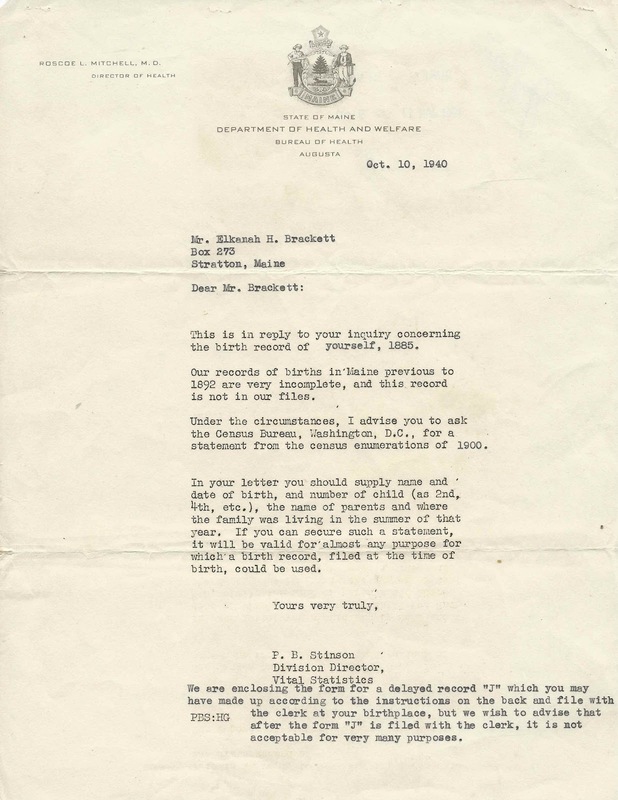 ... the inquirer to ask the Census Bureau, Washington, D.C. for a statement from the census enumerator of 1900. 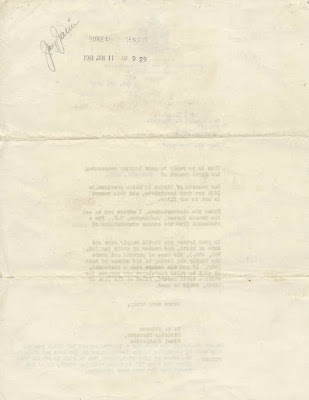 In your letter you should supply name and date of birth, and number of child (as 2ne, 4th, etc. 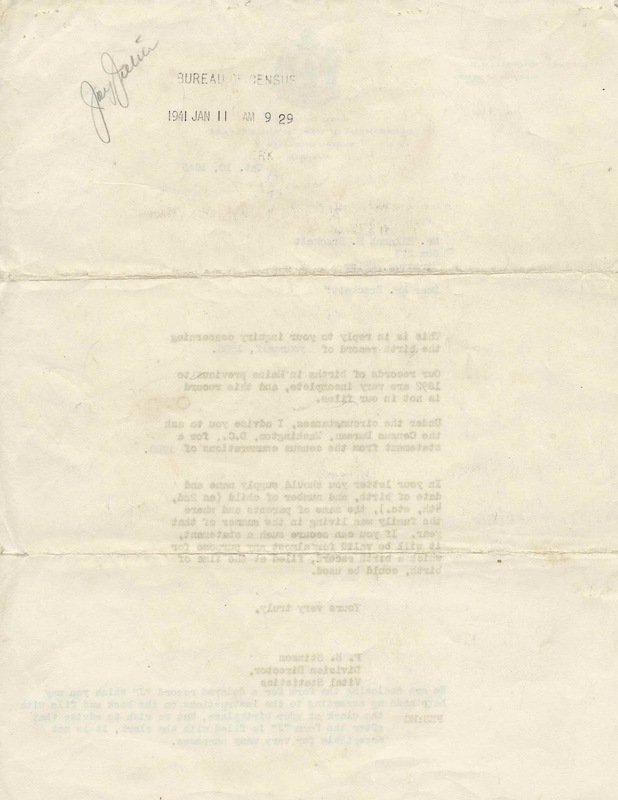 ), the name of parents and where the family was living in the summer of that year. If you can secure such a statement, it will be valid for almost any purpose for which a birth record, filed at the time of birth, could be used. 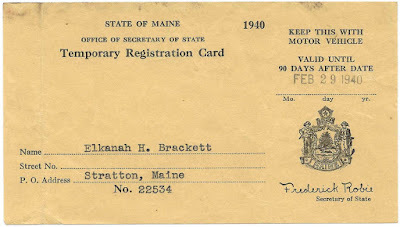 Found with the document is a 1940 Temporary Registration Card from the Secretary of State for the State of Maine issued to Elkanah Herbert Brackett. No information on the type of vehicle is mentioned. Elkanah Herbert Brackett was born December 3, 1885 at New Portland, Maine, the son of Herbert Samuel Brackett and Eleanor Frances (Ball) Brackett. On April 16, 1911 at Portland, Maine, Elkanah married Florentine Louise Leeman, daughter of Charles W. Leeman and Annie F. (Bullen) Leeman. Elkanah and Florentine lived at New Portland, Maine; Eustis, Maine; and Stratton, Maine; they had, I believe, two children. Elkanah worked as a carpenter. He died in 1944, and Florentine in 1987. If you have corrections and/or additions to the information above, please leave a comment or contact me directly; be discreet about providing information on living people.